YouTube videos have been all the rage for years now. Everything from demo videos of kids playing with toys to lectures on the next wave of scientific engineering can be seen on the video streaming platform. For someone doing research, it can offer a great treasure trove of information. So don’t be shy about using YouTube videos for your research essay! Even if you don’t know how to cite them, we’re here to help: This tutorial will show you how to cite a YouTube video APA style. In the screen cap below, we’ve highlighted the areas you need to pay attention to when you’re looking to use a YouTube video for your next paper. APA citation style only needs a few basic pieces of info, so if you know where to find them, you’ll be good to go. 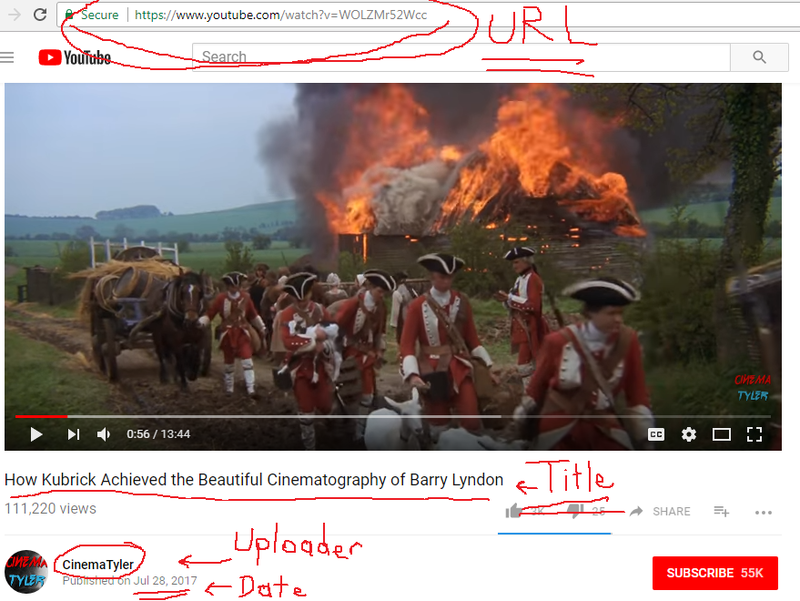 In the screen cap above, we see a video entitled “How Kubrick Achieved the Beautiful Cinematography of Barry Lyndon.” The name of the uploader is CinemaTyler and the video was published on 28 July 2017. The URL is at the top of the page. All of this info is crucial to being able to cite the video in your paper using APA style referencing. Now let’s take a look at how you would do that. Stanley Kubrick was known for being an auteur with the camera. He often sought to have total control over every aspect of his films. With his 1975 film Barry Lyndon, however, he chose to shoot it almost entirely in natural light. As so many of the scenes were set outdoors in England, it meant he was commonly at the mercy of the clouds and their whimsy, one minute letting the sun through and the next minute shutting it out. While many of the film’s scenes have a “picturesque backdrop reminiscent of 18th century paintings” (CinemaTyler, 2017), Kubrick required the usage of a special camera with which he could control the lens to block out and let in as much light as possible to make up for the inconsistency of the outdoor light from one moment to the next. …You can see that the year of the video’s publication is placed in parentheses following the name of the source, which is stated in the sentence itself. No need to restate the name of the source in parentheses—so just putting the year beside the name works fine. Now let’s see how that reference would look on the References page. When referencing a YouTube video in APA style, the basic elements for the reference are the same as in any other website reference. You want to get the author—in our case, we know that CinemaTyler is the author whose name we will use. You want to get the date, and you want to get the URL. The uploader’s name comes first. Our uploader was CinemaTyler, so it is put in full (no abbreviations) in the same place you might put the author of a book or journal source that you would use. Next comes the date. With print sources, the date usually consists of just the year—but with a video file source like a YouTube video, a day and month is given along with the year describing the date of publication—so that can all go in too. Next comes the title: it should be italicized with only the first word of the title and proper nouns capitalized. Everything else should be lower case, unless following a colon or hyphen. Describe the source in brackets as a video file. When getting information online for your research paper, always be sure to jot down where that information is coming from—even if it’s just the URL. Trust us—you’ll be glad you did later. So many times, writers will throw a quote into their paper, cite it in their text, but forget to write down the actual reference on their Reference page. They’ll have a quote, a name it goes to—and that’s it. They may spend hours trying to retrieve the exact location of the source, unable to remember whether it came from a book, blog, video, or wiki. That’s why it’s so important to be careful about how you use sources. Video sources are very helpful—but they can be very hard to find again if you fail to take the necessary information from the video for your Reference List. As a routine practice, you should always immediately write down the reference information for your Reference page at the end of the paper whenever you find a source that you like and want to use. Even if you’re in the swing of things and feel like any stop in your flow of writing might cause you to lose the moment, trust us—it’s better to take a pause and record the info than to keep writing only to forget where the info came from later on. Our writers are standing by to assist you with your research writing. If you’re having trouble finding information on your subject, let us help. 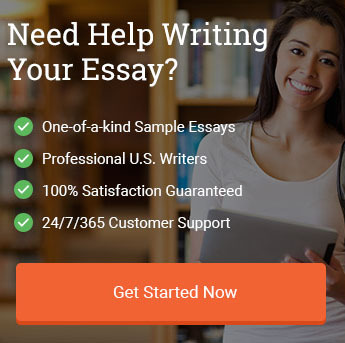 We offer 100% original model essays every day of the year on virtually every subject. Our writers are skilled in researching topics, putting together example papers with references, and helping students to see how their own paper can look. You can see some of the great reviews our clients have left for us over the years [link to customer reviews]. But don’t take their word for it—try us yourself! The Internet has revolutionized the way we all do research now. There are so many access points and pathways to information thanks to online forums, publications, and file sharing platforms. One of the best platforms for information out there today is YouTube. You can find documentaries, lectures, talks, presentations, educational series, and much more all on YouTube. So if you’re looking for some compelling information for your next paper, try going there to find what you need. Just remember, anything you take from a YouTube video will need to be cited. A video on YouTube is no different from any other source you may use for a paper. It just so happens that it’s a video file. Follow the rules and guidelines outlined in this tutorial above and you’ll have no problems. Happy writing! "How to Cite a Youtube Video in APA Format." Aceyourpaper.com. Student Network Resources Inc, 30 January. 2018. Web. 20 April 2019. Student Network Resources Inc. "How to Cite a Youtube Video in APA Format." Aceyourpaper.com. https://www.aceyourpaper.com/citation-guides/apa/how-to-cite-youtube-video-apa-format/ (accessed April 20, 2019).